De Oliewinkel is for those who love fine food and quality products. Our assortment is comprised mostly of products from countries around the Mediterranean, with an emphasis on olive oil from small producers from Italy, Spain, Greece and France. Owners Judith van Unen and Dik Onink opened De Oliewinkel located on the Brouwersgracht in Amsterdam in November 2016. Anna Cruson and Bettien Hermeler complete the team. 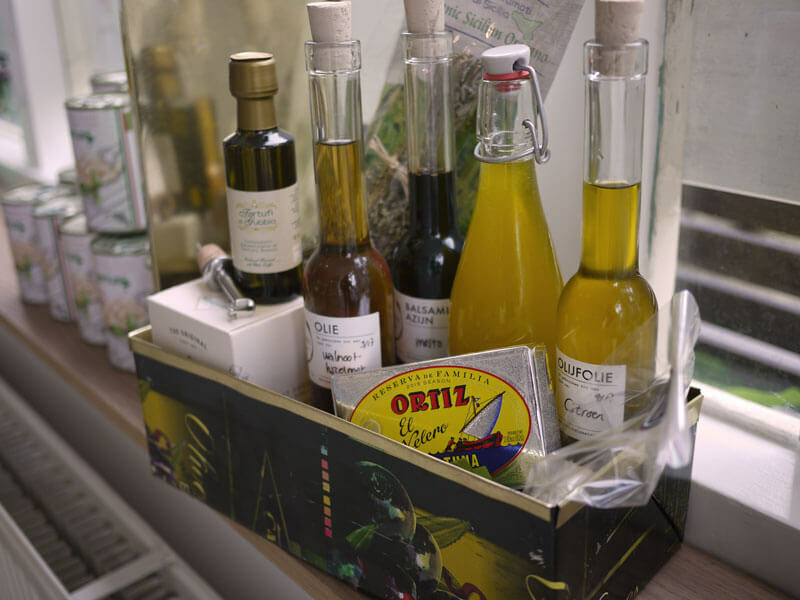 A large part of the assortment, including the olive oil, is supplied by Meeuwig&Zn. The tried and true relationships that Meeuwig&Zn has built up over the last twenty years with producers, guarantees the excellent quality they deliver. In the store, you will find our olive oil in beautiful stainless steel tanks. You can taste all the oils, so that you can make the best choice in picking your preferred oil. The olive oil is poured into glass bottles. De Oliewinkel works with a system, whereby we can refill your bottle and you will receive a discount with your following refill. The rest of the assortment is also selected and compiled with great care. Besides several delicious homemade pesto’s, tapenades and vinaigrettes we also offer an amazing selection of mustards from The Netherlands, Belgium and France for example. 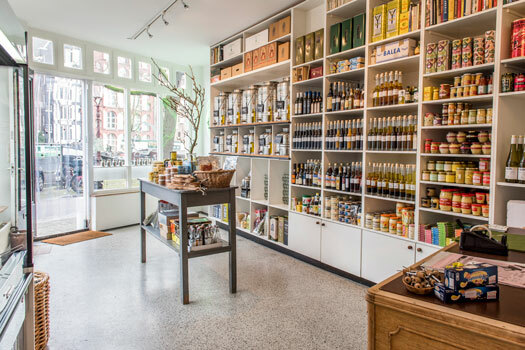 Moreover, De Oliewinkel stocks a large variety of olives, fantastic pickles and the loveliest mayonnaises and dressings. In the centre of the store you will find a table with a great selection of canned fish. Especially the high-quality conserves of the Spanish brand Ortiz are a favourite. However, there is much more that De Oliewinkel has on offer. Besides all the delicious products we also have a selection of olivewood cutting boards and salad serving utensils and even an Italian olive oil soap. We travel far and wide to keep our assortment in De Oliewinkel extraordinary. For a limited time, we stocked caviar and mustard from Magnus Nilsson’s famous restaurant Fäviken in Sweden. In spring 2017 we travelled to Modena and Bologna in Northern Italy, where we visited the producers of our balsamic vinegars and a number of culinary specialty stores and producers. We took back a lot of great products from this trip. It goes without saying that we returned from our visit to Osteria Francescana, Massimo Bottura’s three star restaurant, with inspiration, tips as well as new contacts in Italy. In De Oliewinkel our staff can help you put together a culinary giftpack. From experience, we know that foodies as well as hobbychefs are always very pleasantly surprised and warmly welcome our unique culinary gift packs.